Since I wrote much more than the allotted space would allow, I've included the unedited version below. Enjoy! I know what you’re thinking. Since when are eggs trendy? The egg, historically one of the most common ingredients used in a wide variety of national cuisines, suddenly a culinary phenomenon? Persuading industry professionals that the use of eggs in cooking is a cutting-edge concept is like trying to prove the existence of Santa Claus to a 40 year old man…with children. It’s simply not true. However, while the egg has always been a staple in the kitchen, there is no denying its sudden rise in popularity. In only five years, this household item has evolved from being a widely overlooked component of countless dishes, to an exalted, featured ingredient on menus nation-wide. What’s changed? Why so much attention? What's suddenly made the egg the most popular girl at the prom? While the use of eggs in cooking has always been universal, in recent years the types of eggs being used, the techniques associated with their preparation, and their culinary applications have significantly changed, leading the egg to new found fame. While the industrialization of egg production led to some undeniably positive results, namely its widespread consumption, massive supply also made eggs fade into the background of the consumer’s mind. However, the recent rise in popularity of organic, local, and sustainable food movements has led to greater criticism of factory production and brought attention and praise back to the farm – a shift that has pushed the egg back into the culinary forefront. What, Exactly, is a ‘Farm Egg’? Many restaurants, like Il Cane Rosso located in San Francisco’s Ferry Building, have adopted this philosophy and have switched to using pastured eggs exclusively. Chef de Cuisine, Lauren Kiino, explains that it’s not difficult to notice the difference, “The yolk is dark yellow, and the difference in fat content gives them a deeper, richer flavor that’s better than any other egg.” Customers have also noticed the difference in quality, and their response has been overwhelmingly positive. “Customers tell me all the time that they usually hate egg salad, but are blown away by our egg-salad sandwich. It’s one of our most popular dishes.” This has, in turn, given Chef Kiino more opportunity to feature eggs on the restaurant’s everyday menu: an olive-oil fried egg sandwich is listed for breakfast every morning, and an egg-salad sandwich every lunch. The superior quality of pastured eggs, paired with their versatility in the kitchen, has turned a common ingredient into a powerful tool with which any chef can invent new dishes, update traditional preparations, and expand their menu options. So armed, chefs are now discovering new techniques for cooking eggs, elevating them to an elegant, focal ingredient of the dishes at some of the country’s finest restaurants. Chef Keane settled on this method because, as he describes, “That’s when the white has just set and yolk is still slightly runny. The egg is right on the edge.” This highlights the primary advantage of slow-cooking an egg: heat is applied in a way that cooks the yolk and white almost evenly. Whether soft and just on the border of being undercooked, or custard-like and creamy (the texture Chef Keane desires for the slow-cooked egg yolks he pairs with caviar), the egg’s texture can now be uniform. Chefs like Richie Nakano, of Hapa Ramen in San Francisco, agree that from a business perspective, slow-cooking the egg is a major advancement for the industry. In a single night of serving as many as 300 bowls of his much-acclaimed ramen (served with a slow-cooked egg instead of a traditional hard-boiled egg), he can go through as many as 200 slow-cooked eggs. “I don’t know how I could boil 200 eggs during service - it wouldn’t be possible.” And, dropping 200 eggs into a bath set at 62.5 Celsius and leaving them for 60-90 minutes gives Chef Nakano the time to concentrate on other tasks. “During service, I can just put them in the bath, leave them, and know that they’re not going to overcook. Even if I realize late that they needed to be pulled, they’re still fine after an extra 15-20 minutes.” Thus, slow-cooking is beneficial to both chefs and consumers: restaurants serve more customers, who in turn enjoy consistent, higher-quality food. While novel techniques have helped transform the way eggs are regarded, it’s not just how an egg is cooked that has evolved; more than ever, even commonly-cooked eggs are being used to create new and improved dishes. Ready to dominate the culinary world with pastured eggs and cutting-edge, efficient techniques, chefs have started using eggs in ways that break tradition. There are certain social norms associated with cooking traditional, American fare: burgers can be topped with cheese, lettuce, onion, or tomato; pizzas are covered in cheese, meat, and select vegetables; and because growing up your mom only cooked eggs for breakfast, morning is unquestionably the only acceptable time to eat them. But a quick glance at current menus proves that eggs are separating from tradition; once the June Cleaver of the kitchen, now the James Dean of cuisine, the egg has emerged with one, clear goal: to break all of the rules. The egg’s quest to overthrow tradition has reached another American favorite – pizza. Not yet a staple on deep-dish and New York style pizzas, the tremendous rise in popularity of the Neapolitan pizza, commonly served in Italy with an egg on the top, has given the egg yet another platform to demonstrate its culinary versatility. Because many Neapolitan preparations demand fewer ingredients and contain less fat than their American counterparts, the egg can provide essential balance. At Pizzeria Mozza in LA, Chef Matt Molina offers a farm egg, guanciale, escarole, radicchio, & bagna cauda pizza, relying on the fat of the egg (and guanciale) to balance the bitter acidity of the greens, and also temper the salty, spicy bite of the sauce. Despite its shocking lack of cheese, it has become a customer favorite. Chef Molina also explains that, because this type of pizza is cooked at a high heat (600-800 degrees) for a very short amount of time (3-5 minutes), “The egg can be cooked until the whites are coagulated and the yolk is soft and rich.” His trick for maintaining the integrity of both the crust and the egg under such heat? “We cook our egg pizzas half way in the oven, then crack the egg on top to maintain its medium rare consistency without over cooking the egg.” While many Americans have been raised to overcook their breakfast eggs and shudder at the sight of a runny yolk, restaurants like Mozza are helping diners abandon their pre-conceived notions and embrace unusual, but delicious, preparations. Although the egg’s culinary horizons have expanded, its increased consumption can’t solely be attributed to novel preparations, or even its sudden appearance in traditional dishes. Although the egg has busy revamping menus, the association between the egg and breakfast cuisine is as strong as ever. In fact, now that the rules for how and when an egg should be used have changed, classic breakfast preparations leaving those early morning hours behind and are making their way onto our lunch and dinner menus. Although it seems like everyone loves eating breakfast for dinner, many chefs like Mark Dommen of Michelin-starred restaurant One Market, were skeptical at first. “Some people that had visited the restaurant suggested that I add a seasonal omelet to the menu. I just didn’t think it would work. But for about three years now it’s been one of our most-sold lunch items.” Business lunch over a Petaluma Farms, three egg, open-faced omelet? Add some squash blossoms, onions, and ricotta cheese, and that sounds like a deal to me. This trend has fully taken off: if you look closely, breakfast is everywhere. “Farm egg in a hole” for dinner at Italian-inspired SPQR? Why not? The Hangtown Fry from Wayfare Tavern at 8 pm? No problem. 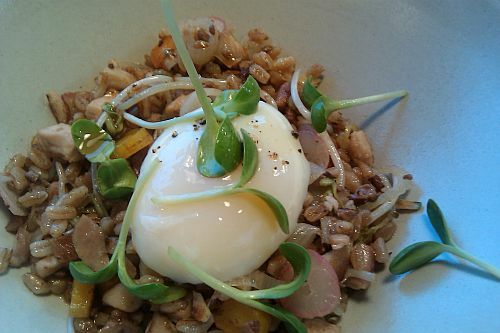 Or better yet, poached scrambled eggs off of the tasting menu at Coi, a two-star Michelin rated restaurant? Sounds delicious. With overwhelmingly positive feedback from diners, who revel in the comfort of such dishes, it’s no surprise to see the egg get out of bed and start working around the clock. Chefs unanimously agree that elevating cuisine through the use of eggs starts with buying the most beautiful, pastured eggs available. So even if dozens of novel ideas have hatched in your mind, don’t fly into the kitchen without grasping this fundamental rule: to create an incredible dish, you have to start with an incredible egg. dozens, hatched, don't fly, genius writing.